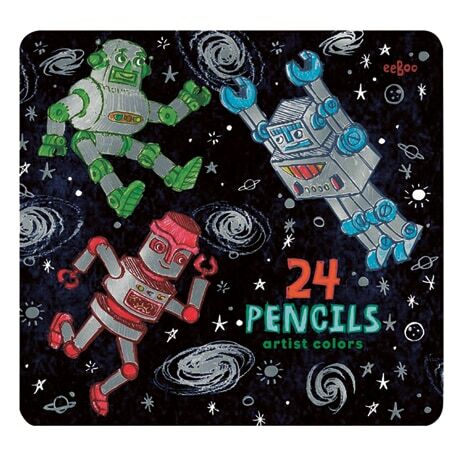 Robots romp through space in the lighthearted Brandon Reese illustration on the cover of this colored pencil tin, while the pencils themselves are wrapped in a candy-cane stripe of silver foil. These artist-quality pencils are just the thing for making the most of those finely detailed coloring books for adults, as well as for drawing your original artwork. The assortment contains 24 pre-sharpened pencils, nearly 7 inches long, including several shades of blues, browns, reds, pinks, greens, and yellows, as well as black and white. The flat storage tin stows neatly away with your books, while the inner divider keeps your colors orderly and easy to find.